Cesare Andrea Bixio, an extremely versatile and creative composer, was born in Naples on 11th of October 1896. He soon revealed his musical talent, writing his first song, Suonno e Fantasia, when he was only thirteen years old. He then started to frequent the variety theatre where he would meet the artists and singers who were to launch successfully his repertoire. In 1920, Bixio founded in Naples the first Bixio Publishing Group bearing his name, that was to become one of the outstanding Italian labels of pop music, particularly soundtracks. In fact, the invention of sound-film gave Bixio the chance to achieve further goals and become Italy’s most authoritative sound-track composer. 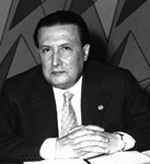 In 1930, he wrote the soundtrack of the first Italian talking movie, La Canzone dell’Amore , thus beginning a long and creative collaboration with the cinema, along with a successful co-operation with great performers of lyrical music, including Tito Schipa, Beniamino Gigli, Gino Bechi, Giuseppe di Stefano and Luciano Pavarotti, to name only a few ones, whose great performances made Bixio's melodies famous all over the world. Maestro Cesare Andrea Bixio died in Rome on 5th of March 1978.